I found this recipe years ago in Cook’s Illustrated for a coconut layer cake. I love coconut cake, and this one looked perfect, as most “Cook’s” recipes are. I’m just now finally getting around to making it, and I’m so thrilled I did! The original recipe is for a 4-layer cake, but I wanted to make cupcakes so that I could share with several people, and they turned out great! The frosting is so rich and heavenly, a cupcake is the perfect portion. You can find cream of coconut in the drinks section of the grocery store, or in the Mexican section, which is where I found it…Goya makes it. When you open the can, it will probably be really separated. The best way I found to fix that was by pouring it in to a medium bowl, microwaving it for 30-45 seconds, then whisking it until it’s smooth. Make sure it’s room temperature before using it. 1. Adjust oven rack to lower middle position and heat oven to 325 degrees. Line muffin tins with 24 paper muffin cups. 2. Beat egg whites and whole egg in 4-cup measuring cup with fork to combine. Add cream of coconut, water, vanilla, and coconut extract and beat with fork until thoroughly combined. 3. Combine flour, sugar, baking powder and salt in bowl of standing mixer fitted with paddle attachment. Mix on lowest speed to combine, about 30 seconds. With mixer still running on lowest speed, add butter 1 piece at a time, then beat until mixture resembles coarse meal, with butter bits no larger than small peas, 2 to 2 1/2 minutes. 4. With mixer still running, add 1 cup liquid. Increase speed to medium-high, and beat until light and fluffy, about 45 seconds. With mixer still running, add remaining liquid in steady stream (this should take about 15 seconds). Stop mixer and scrape down bowl with rubber spatula, then beat at medium-high speed to combine, about 15 seconds. 5. Divide batter between muffin cups to 3/4 full. Bake until deep golden-brown, and toothpick inserted into center comes out clean, about 20 minutes (rotate pans after 10 minutes). 6. Cool in pans on wire racks about 10 minutes, then remove from muffin tins and cool on racks completely. 7. While the cakes are cooling, spread shredded coconut on rimmed baking sheet; toast in oven until shreds are a mix of golden brown and white, about 10-15 minutes, stirring 2 or 3 times. Watch closely, they get dark fast! 1. Combine whites, sugar and salt in bowl of standing mixer, set bowl over saucepan containing 1 1/2 inches barely simmering water. Whisk constantly until mixture is opaque and warm to the touch and registers about 120 degrees on an instant-read thermometer, about 2 minutes. 2. Transfer bowl to mixer and beat whites on high speed with whisk attachment until barely warm (about 80 degrees) and whites are glossy and sticky, about 7 minutes. Reduce speed to medium-high and beat in butter 1 piece at a time. Beat in cream of coconut and coconut and vanilla extracts. Stop mixer and scrape bottom and sides of bowl. Continue to beat at medium-high speed until well combined, about 1 minute. 3. Frost cupcakes generously with frosting. (You will probably have some left over, since this recipe is for filling and frosting a 4-layer cake. If you don’t want leftover frosting, make 3/4 of a recipe.) 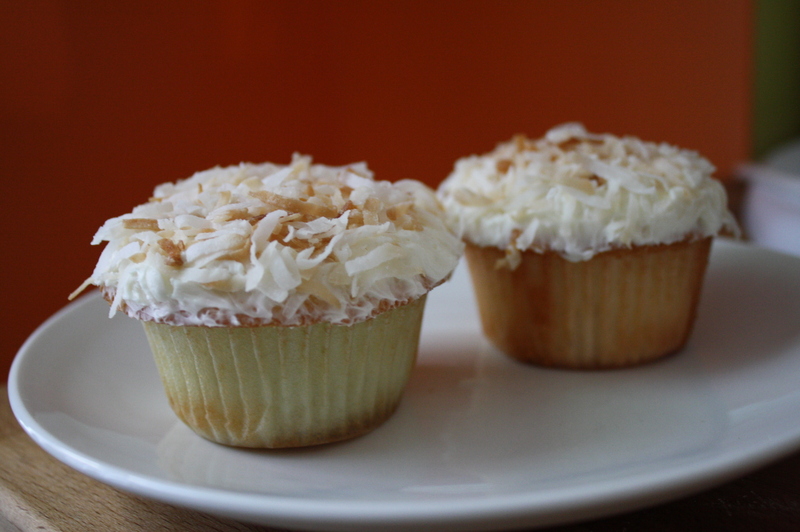 Top each cupcake with toasted coconut. You can also make this cake into a 9 inch round layer cake. If you do, grease and flour 2-9 inch round cake pans or line with parchment paper. When cakes are cool, slice each layer in half horizontally, creating 4 layers. Frost each layer with about a cup (or less) of frosting in between, then frost the top and sides with the remainder. Spinkle the top of the cake with coconut. Then press the coconut into the sides. I love that frosting. Great recipe. 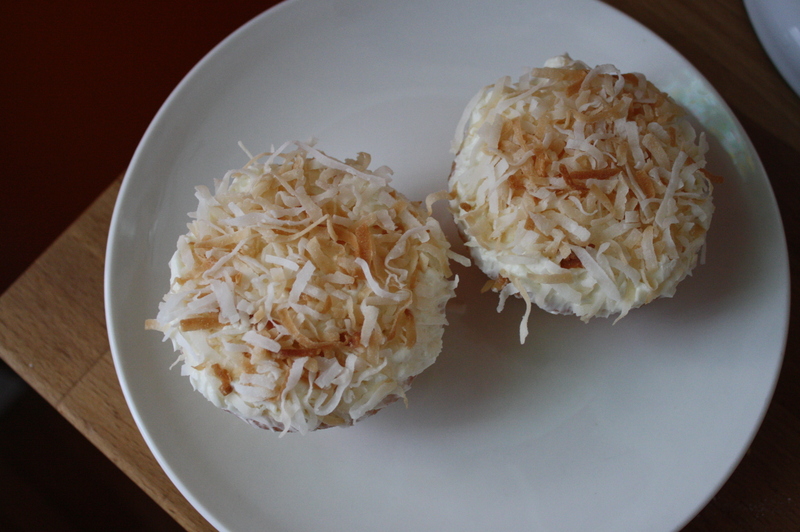 these coconut cupcakes look delish! i’m on a coconut kick these days, so i just might have to try out this recipe sometime soon. thanks for sharing!